Imagine the year is 1533. You’re going to the capital city to pay your respects to the king. To enter the plaza, there are 8 doorways, but each entryway is only big enough for 1 person to enter at a time. You’re not the only one going to greet Atahualpa, your king. You’re with about 20,000 of your closest friends. All of you are crowding to the center to see the king better. When he arrives, he does so on a litter, and comes right to the center of the plaza. But, just then someone you’ve never seen approaches Atahualpa. He’s carrying something else you’ve never seen before, a bible. When he greets your king he starts speaking some weird foreign language. He has a friend with him who speaks after he does in your language. The strange foreign man tells your king that he needs to convert to his religion. Why? Because the bible he’s carrying told him it was the true religion. How can a book talk, you wonder. So does Atahualpa, your king. Atahualpa holds the bible up to his ear, then says he can’t hear anything. He puts the book down. The strange foreign man signals something, and suddenly you are all surrounded by more strange looking men who are killing your 20,000 closest friends (women, children, and warriors). You run for one of the exits, but you can’t get out. The doorways are too narrow to let people out fast enough. The Spanish conquistadors capture Atahualpa and imprison him in a small room. He’ll fill the room (he’s being held captive in) twice with silver, and once with gold (as high as he can reach). After that, the Spanish will let him go. Instead, they kept him prisoner. And sentenced him to death, by being burned at the stake. Atahualpa believed that if the body was burned, it would’t enter into the afterlife. Atahualpa converted to Christianity in exchange for a sentence of “death by strangulation” instead of burning. 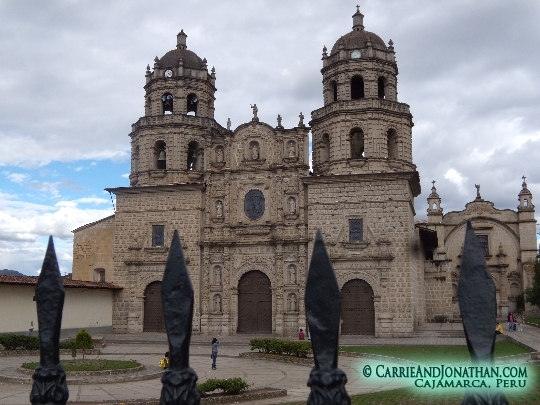 He was baptized into Catholicism with the name Juan Carlos Atahualpa. He was still strangled to death, after he paid his own ransom of course. And later, after he died, he was burned anyway. So, there’s your history lesson. And, here’s what we did today. 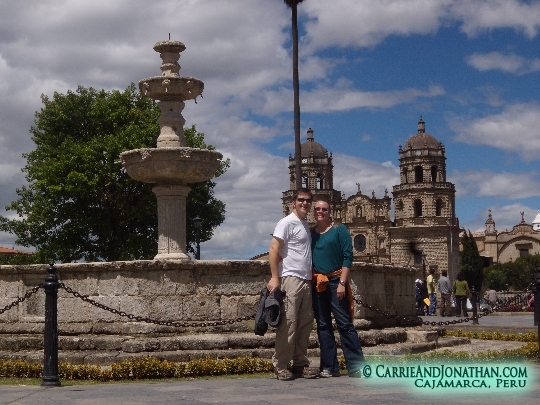 Jonathan and I went to visit the plaza at Cajamarca. It not only was where Atahualpa was captured, but where he was killed as well. 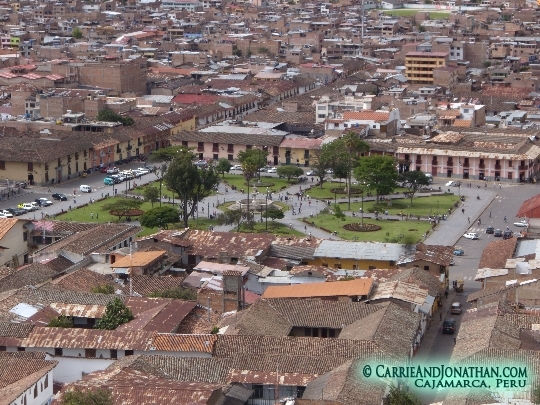 Today, the plaza still stands in the same place as it did in 1533. However, 500 years ago, it was much bigger than it is today, in part because the Spanish decreased its size in order to build churches. It was really interesting to stand in the place where the Incan empire fell. 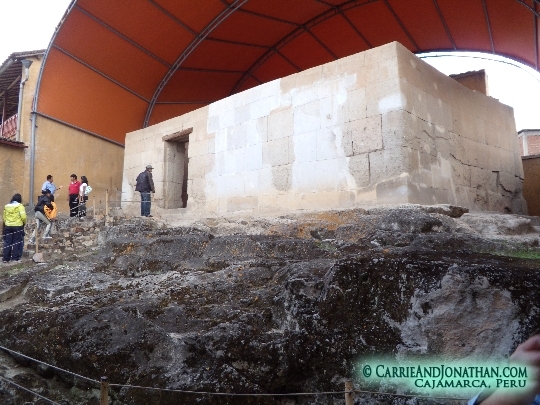 We also went to the only surviving Incan structure in Cajamarca: El Cuadro Rescate. 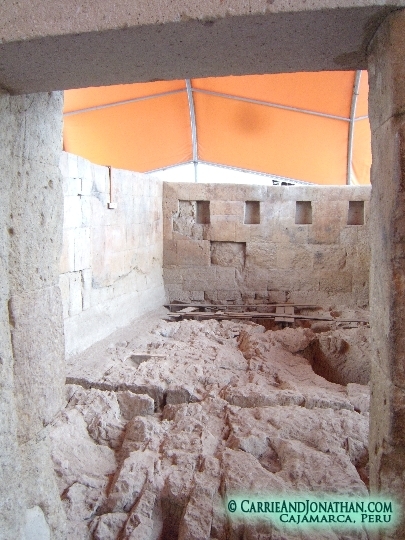 This is the room where Atahualpa was held prisoner and the room which he filled twice with silver and gold. You can see the line here, where legend has it Atahualpa could reach to this line. How true this is, is anybody’s guess. One interesting thing about El Cuadro Rescate, is that at one point in the not-so-distant past, it was used as someone’s house. See the grey “stone” in the picture below? That’s cement. The people who turned this Incan building into a house, cut out more doors. 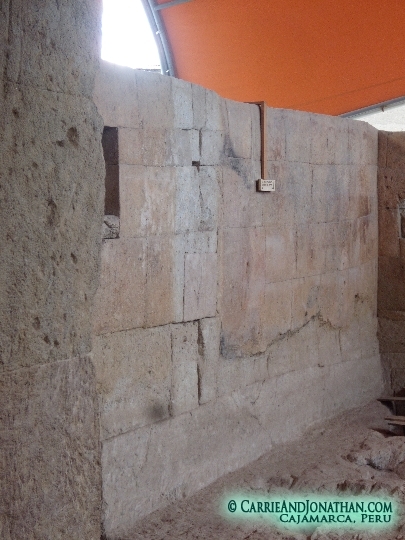 The doorway on the left is a renovation to the original structure as well. They know this because the crossbeams are wood, and the Incans used only stone. The rocks below the Incan structure are pre-Incan. They were aqueducts and pools belonging to the Caxamarca people (those before the Incas, conquered by the Incans). To see the plaza was free. But it cost each of us $0.70 to see El Cuadro Rescate. Definitely worth it. However, we also paid for a guide ($3), and that wasn’t really worth it to us. I didn’t learn much new from him than I did reading about Atahualpa in our Spanish classes. We had an excellent day full of history exploration.